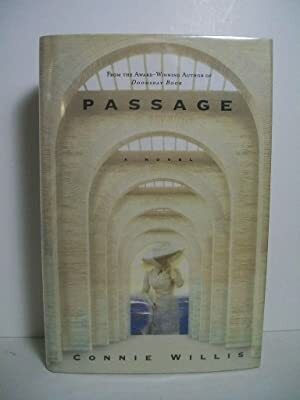 One of those rare, unforgettable novels that are as chilling as they are insightful, as thought-provoking as they are terrifying, award-winning author Connie Willis's Passage is an astonishing blend of relentless suspense and cutting-edge science unlike anything you've ever read before. It is the electrifying story of a psychologist who has devoted her life to tracking death. But when she volunteers for a research project that simulates the near-death experience, she will either solve life's greatest mystery -- or fall victim to its greatest terror. At Mercy General Hospital, Dr. Joanna Lander will soon be paged -- not to save a life, but to interview a patient just back from the dead. A psychologist specializing in near-death experiences, Joanna has spent two years recording the experiences of those who have been declared clinically dead and lived to tell about it. It's research on the fringes of ordinary science, but Joanna is about to get a boost from an unexpected quarter. A new doctor has arrived at Mercy General, one with the power to give Joanna the chance to get as close to death as anyone can. A brilliant young neurologist, Dr. Richard Wright has come up with a way to manufacture the near-death experience using a psychoactive drug. Dr. Wright is convinced that the NDE is a survival mechanism and that if only doctors understood how it worked, they could someday delay the dying process, or maybe even reverse it. He can use the expertise of a psychologist of Joanna Lander's standing to lend credibility to his study. But he soon needs Joanna for more than just her reputation. When his key volunteer suddenly drops out of the study, Joanna finds herself offering to become Richard's next subject. After all, who better than she, a trained psychologist, to document the experience? And just when you think you know where she is going, Willis throws in the biggest surprise of all -- a shattering scenario that will keep you feverishly reading until the final climactic page is turned. Most of us would rather not spend a lot of time contemplating death, but the characters in Connie Willis's novel Passage make a living at it. Joanna Lander is a medical researcher specializing in Near Death Experiences (NDEs) and how the brain constructs them. Her partner in this endeavor is Richard Wright, a single-minded scientist who induces NDEs in healthy people by injecting a compound that tricks the brain into thinking it's dying. Joanna and Richard team up and try to find test subjects whose ability to report their experiences objectively hasn't been wrecked by reading the books of pop-psychologist and hospital gadabout Maurice Mandrake. Mandrake has gained fame and fortune by convincing people that they can expect light, warmth, and welcoming loved ones once they die. Joanna and Richard try to quantify NDEs in more scientific terms, a frustrating exercise to say the least. The brain cells started to die within moments of death. By the end of four to six minutes the damage was irreversible, and people brought back from death after that didn't talk about tunnels and life reviews. They didn't talk at all.... But if the dying were facing annihilation, why didn't they say, "It's over!" or, "I'm shutting down"?... Why did they say, "It's beautiful over there," and, "I'm coming, Mother!"